Whatever you do, don’t just believe everything you’re told; every statement should be taken apart and scrutinised before, reluctantly, you accept that it might conceivably be true. Historically, doubt has been deplored more often than deployed. Skepticism is not inborn, but an ineluctable product of watchful experience. If you don’t have a better argument to explain the Bible stories. . .
Recall from my previous post Norman Walker’s insistence that academics should not be about criticizing arguments unless they can produce better hypotheses in their place. Is it really always more important to build than to destroy? This, after all, is the fundamental question that describes the disdain with which much skepticism is regarded. Should the skeptic feel bound to replace discredited ideas with better ones? Walker and the others are far from alone in thinking so. So this is how the (ultimate) historicity of the gospel narratives becomes the unchallengeable conventional wisdom. If we are unable to convince Montefiore and his peers of a better explanation for the Magi story at the birth of Jesus then we are to conclude that the story must have had a historical basis. 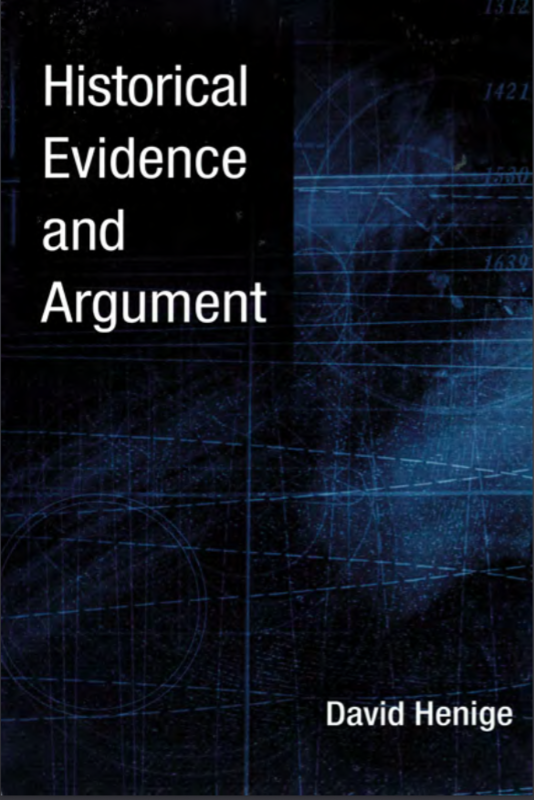 To continue the theme of fundamental principles of historical reasoning this post selects points from Historical Evidence and Argument by David Henige (2005). They all come from the fourth chapter titled “Unraveling Gordian Knots”. As a result, issues are visited and revisited as often as needed. The result can be to strengthen probability or to weaken it — odds that might seem too risky for those who believe that progress must be inexorable. Given this caveat, the practical advantages of pyrrhonism are patent. The most important is that declining to accept or believe keeps questions open as long as necessary. 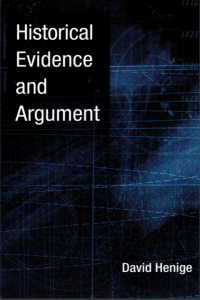 Practitioners learn to flinch when they meet terms like “certainly,” “without doubt,” “of course,” or “prove/proof” in their reading, seeing them as discursive strikes designed to persuade where the evidence, or its use, prove insufficient. They have learned that, since new evidence and new techniques are constantly coming forth, they are sensible to withhold final judgment. 7 Discussions of pyrrhonism include Naess, Scepticism; Vansina, “Power of Systematic Doubt;” Wlodarczyk, Pyrrhonian Inquiry. In scolding his most persistent critic, Marshall Sahlins asks: “[w]hy, then, this stonewalling in the face of the textual evidence? I’m sure anyone who has read some of the intemperate responses of scholars outraged by Christ Myth or “mythicist” challenges to the traditional reading of Paul’s letters will hear clear echoes here. I’m also reminded of Emeritus Professor of New Testament Language, Literature and Theology Larry Hurtado’s complaint that my questions were only designed to sow doubt and served no constructive function. Are Mythicist Sceptics Hypocritical for Attacking Creationists? This is a small snippet from the latest blog post by David Fitzgerald, Flame War On . . .